Indiana has long been one of the nation’s leaders in agricultural productivity. Favorable temperatures and precipitation help Indiana farmers generate over $31 billion worth of sales per year, making the state 11th in total agricultural products sold1. Changes to the state’s climate over the coming decades, including increasing temperatures, changes in precipitation amounts and patterns, and rising levels of carbon dioxide (CO2) in the air will result in several direct and indirect impacts to the state’s agricultural industry. This report from the Indiana Climate Change Impacts Assessment (IN CCIA) describes how projected changes in the state’s climate will affect the health of livestock and poultry, growing season conditions for crops, the types of crops that can be planted, soil health and water quality as well as weed, pest and disease pressure for agricultural production statewide. Key finding: Warmer overnight temperatures in Indiana have contributed to reduced corn yields over the last decade. Elevated overnight temperatures increase plant respiration, reducing sugar availability for grain production, and can affect the timing and success of pollination—resulting in lower crop yield. Observations show that Indiana corn yields are reduced by about 2 percent for every 1°F increase in overnight temperatures during July. Coping with change: Earlier planting or using varieties that more quickly reach maturity could help corn plants avoid summer heat stress during pollination. Breeding corn for traits that improve factors contributing to yield in warmer conditions may also help offset the effect of warming overnight temperatures. Key finding: More frequent heat stress and a doubling of water deficits are expected to reduce Indiana corn yields, for current varieties, by 16 to 20 percent by mid-century. Soybean yields are expected to decline 9 to 11 percent. Coping with change: Yield losses could be partially offset with changes in cropping systems, planting date, crop genetics, soil health, supplemental irrigation and/or drainage management. 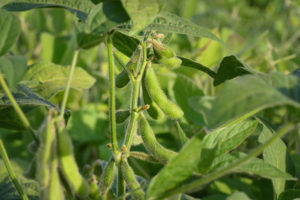 Increasing atmospheric carbon dioxide may lessen yield losses in soybeans, and double-cropping of soybeans will become increasingly viable in southern Indiana. 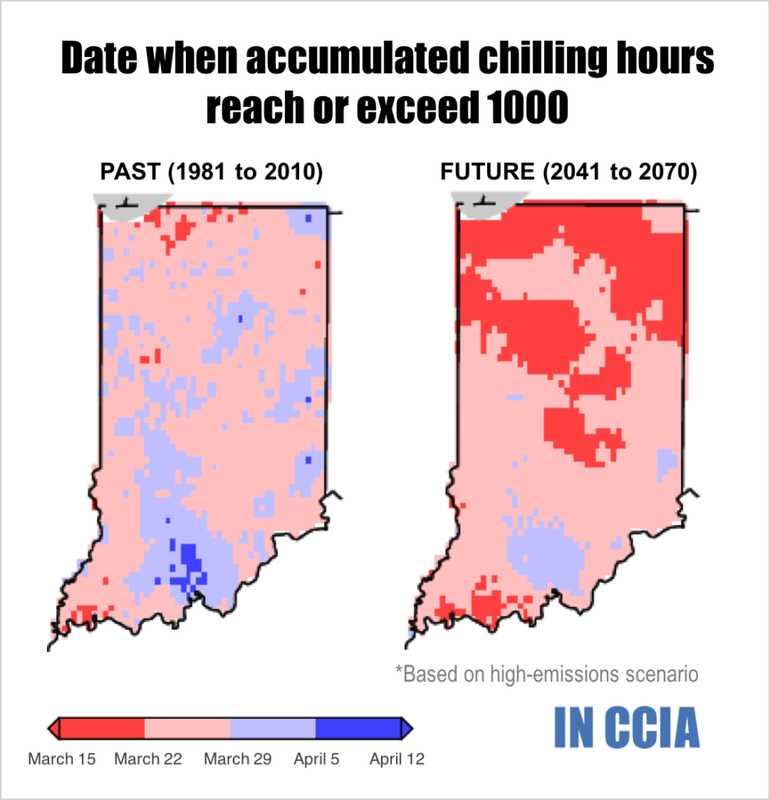 Key finding: While Indiana’s frost-free season is expected to start about one month earlier by mid-century, average crop planting dates are not expected to significantly shift due to increased spring rainfall limiting early access to fields. Observations over the last 30 years show a declining number of days suitable for spring fieldwork in Indiana, and this trend is expected to continue. Coping with change: Improving soil health with management practices that increase soil stability and water movement can help with managing additional spring rainfall. Fall-planted cereal crops that continue growing into early spring can aid in extracting excess soil water, potentially providing earlier field access. Investing in additional subsurface drainage and machinery suitable for wetter conditions may also improve field accessibility. Key finding: The onset of winter dormancy in perennial trees and vine fruit, as signaled by the first killing frost, is projected to occur 10 days later in Indiana by mid-century. Warmer winter and spring temperatures will allow plants that have accumulated enough chilling hours to break dormancy up to 2 weeks earlier in the spring, meaning some fruit crops may begin flowering before the risk of frost damage has ended. By mid-century, reduced chilling in some areas of Indiana may no longer meet the requirement for bud emergence for some varieties of apples, peaches and grapes. Coping with change: Winter damage may be reduced, in part, by developing cultivars with improved dormancy that do not respond to brief winter and spring warm periods. A warming of Indiana’s coldest annual temperatures will expand the suitable range for peach, pluot and nectarine production and it may become possible to grow fruit that currently lacks hardiness for Indiana’s climate, like boysenberry and tayberry. 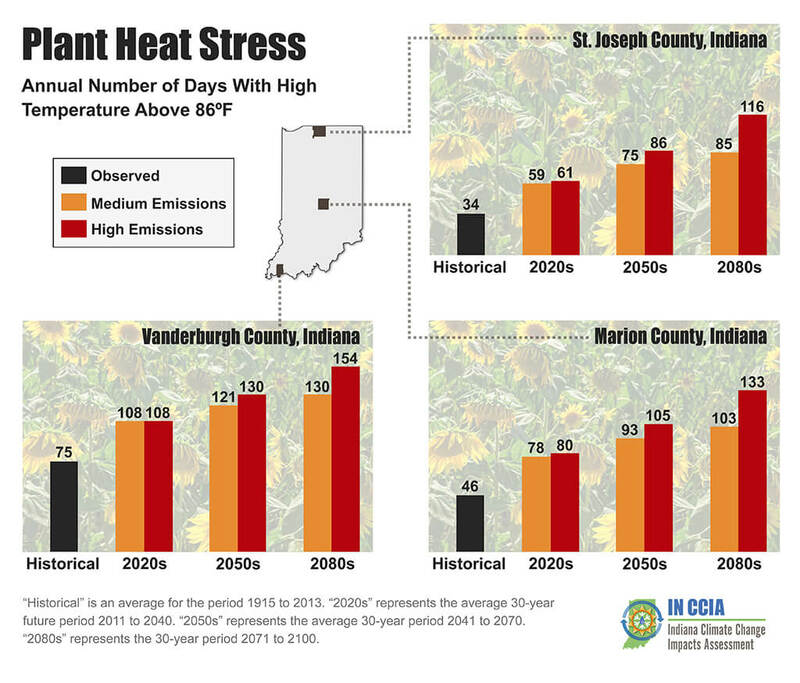 Key finding: Higher temperatures will put Indiana livestock at increased risk of heat stress, which can lead to reduced animal feed intake, productivity and fertility. By mid-century, the annual number of days with high temperatures above 86°F, a critical threshold for livestock heat stress, is projected to double from 40 days per year to 80-100 days per year. The average duration of heat stress events is also expected to double. Coping with change: Maintaining optimal microclimates for confined feeding operations may require improved or expanded ventilation systems and increased energy, operating, and maintenance costs. Pasture-based systems may incur costs of additional shelters or other environmental buffers to protect animals from the increased frequency of weather extremes. Key finding: Decreasing forage quality is a serious threat to Indiana livestock and poultry. Warmer temperatures will decrease plant protein content and increase neutral detergent fiber levels in certain legumes, including alfalfa, affecting animal growth and milk production. Variable winter conditions may also affect overall forage quantity. Coping with change: Despite their climate sensitivity, C3-photosynthetic legumes still provide better quality forage than C4 grasses because the very high fiber, low intake and poor digestibility of C4 plants severely limit animal performance. Key finding: Increasing winter and spring precipitation will result in about a 30 to 50 percent increase in spring subsurface tile drainflow in Indiana by mid-century. These shifts will likely lead to nutrient loss from farm fields, and some existing drains may be overwhelmed by the higher flows. Coping with change: Implementing in-field and edge-of-field conservation practices can reduce nutrient losses. Capturing drainflow during the non-growing season could become more effective as the timing of peak drainflow is projected to occur earlier in the winter and spring. Increased use of winter cereal crops, like rye, that capture nutrients and transpire water may help with managing water-stressed fields. Key finding: Warming temperatures have the potential to increase rates of soil organic matter decomposition in Indiana by about 50 percent by mid-century, which can reduce infiltration and soil water holding capacity and increase the release of carbon dioxide and nitrogen gases from the soil into the atmosphere. Coping with change: Adopting management practices that improve overall soil quality, such as increasing plant diversity and use of cover crops and reduced/no-till systems, can help maintain soil organic matter even as temperatures warm. Key finding: Warmer winters, wetter springs and hotter summers may result in increasing weed, pest and disease pressure on Indiana’s agricultural production. These indirect influences are complex, difficult to predict and can be positively or negatively affected by farm management decisions. Coping with change: With no change to current cropping systems, producers of all crops will likely need to increase foliar pesticide and herbicide applications, increasing the risk of pesticide resistance. Pest disease damage may be reduced by selecting plant species with increased insect and disease resistance. The findings presented in this report are based primarily on the IN CCIA Agriculture Working Group technical report (Bowling et al., in review) and the IN CCIA report Indiana’s Past and Future Climate (Widhalm et al., 2018). Future climate projections in this report are based on an ensemble average of six global climate models for mid-century (2041 to 2070) and late-century (2071 to 2100) (see Byun and Hamlet (2018) and Hamlet et al. (in review) for details). Two future scenarios of greenhouse gas concentrations are considered—“medium” and “high.” These scenarios follow Representative Concentration Pathways (RCPs) 4.5 and 8.5, respectively, which have been used to develop many previous projections summarized by the Intergovernmental Panel on Climate Change2. 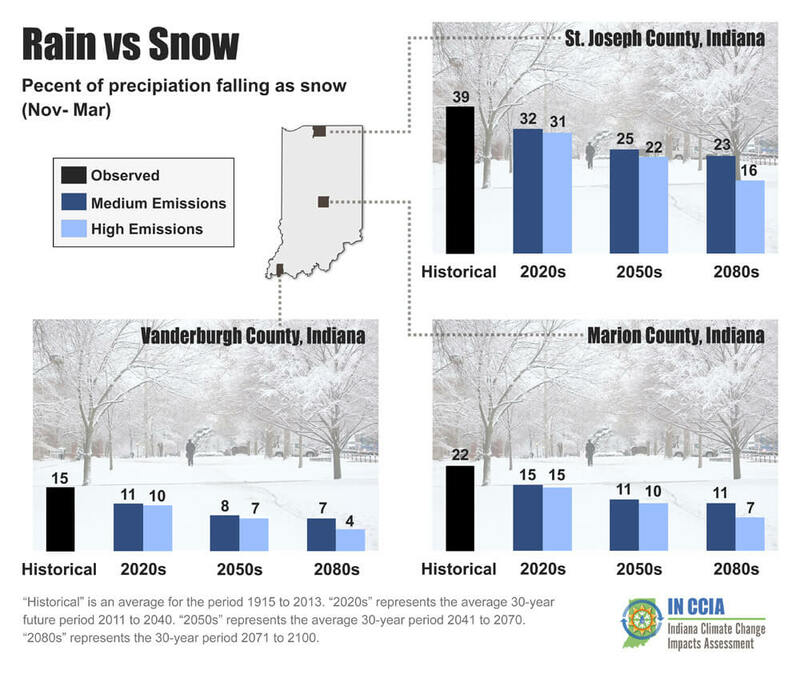 Additional information about the techniques and assumptions of climate modeling are found in the IN CCIA report Indiana’s Past and Future Climate. Versions of the Variable Infiltration Capacity (VIC) model coupled to the CropSyst crop simulation model were used to project the effects of agricultural subsurface drainage, crop yield and other factors key to understanding how climate change will affect the future of Indiana agriculture. Indiana once was home to traditional mixed farming operations that integrated livestock, grain, forage, fruit and vegetable production. That changed significantly in the 1970s when economic trends led to larger farm sizes. Today, Indiana farms are more specialized and larger than in the past, making them more vulnerable to climate-related risk. In 2017, corn and soybeans accounted for 5.4 million and 6 million of Indiana’s agricultural acres, respectively, totaling 78 percent of all farmland3. Indiana is third in the United States (U.S.) in soybean production, fifth in corn production and in the top ten for several specialty crops, including blueberries, peppermint, processing tomatoes, watermelon, cantaloupe, snap beans and cucumbers. The state is also in the top ten for production of hogs, chickens, turkeys, ducks and eggs. Agriculture is an important part of the state’s economy, contributing nearly 5 percent of the state’s gross domestic product (GDP). More than 56,000 farms over about 15 million acres provide more than 107,000 jobs throughout Indiana1. That creates $31.2 billion in value through sales of agriculture-related products, including $4.6 billion in exports per year1. The agricultural sector is highly sensitive to shifts in temperature, precipitation and atmospheric CO2, which directly affect crop growth, livestock and poultry productivity and other agricultural concerns. For example, excess water from heavy rainfall in June 2015 destroyed 5 percent of Indiana’s corn and soybean crop, leading to $300 million in losses (Pack, 2015). Drought and extreme heat during the 2012 growing season reduced Indiana corn yields 64 bushels per acre below the long-term trend and resulted in more than $1 billion in crop insurance payments to Hoosier farmers4. Abnormally warm early spring temperatures followed by seasonal April freezes resulted in a nearly complete loss of Indiana’s apple crops in 2007 and 2012, and the warm and wet summer of 2016 resulted in 20 to 100 percent loss of Indiana’s most popular U-pick apples, including Honeycrisp, Gala and Jonagold. Shifting climate patterns have indirect effects on agriculture, too, through altered patterns and prevalence of weeds, pathogens, insects and invasive species. Agricultural production involves complex interactions among multiple integrated systems, with weather affecting management and planting decisions that, in turn, affect soil health and long-term sustainability. This report focuses on field-level changes affecting agricultural production. The downstream impacts of land-use change, nitrate leaching, soil erosion and water availability are addressed in subsequent reports in the IN CCIA series. Over the last century Indiana has become warmer and wetter. Average temperatures have risen 1.2°F and annual precipitation has increased by 5.6 inches (learn more about Indiana’s Climate Trends). These trends are expected to continue and accelerate in the coming decades. Above: Projected change in Indiana’s average growing season temperature and rainfall by mid-century. The growing season is defined as May 1 to Aug. 31. Mid-century represents the average of the 30-year period from 2041 to 2070. Projected changes are relative to a 30-year historical period from 1981 to 2010. The range represents projections for medium- and high-emissions scenarios. Source: Bowling et al. (in review). Indiana scientists project that annual statewide temperatures will increase by 5 to 6°F by mid-century and 6 to 10°F by late-century, depending on the amount of heat-trapping gases released into the atmosphere by human activities5. 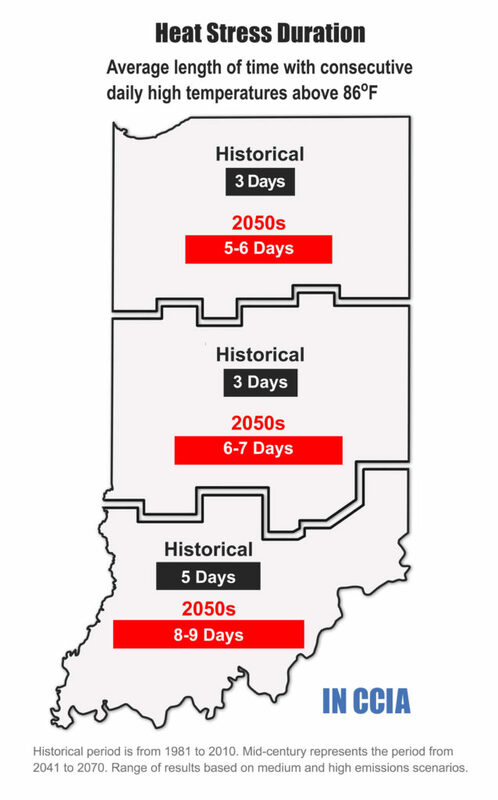 Mid-century temperatures during Indiana’s growing season, defined as the period from May 1 to Aug. 31, are expected to increase by about 6 to 7°F6. Statewide annual precipitation is projected to increase by 6 to 8 percent by mid-century and 5 to 10 percent by late-century7, depending on heat-trapping gas emissions, with important and notable differences by season. Mid-century precipitation during Indiana’s growing season is projected to have little or no change compared to historical conditions6. The combined effects of rising temperatures with no additional rainfall will result in greater water demands and increased water stress. Rising temperatures will extend the length of the growing season throughout the state, offering opportunities to grow different types of crops or to double-crop in some places. But those temperature increases will come with more plant heat stress days, and reduced summer precipitation and increased water demand are projected to reduce soil moisture and lead to drought or drought-like conditions that will further stress and damage crops. Predicting how crops will respond to future conditions is challenging since many factors, from increased CO2, to temperature and precipitation changes, all play roles. In some cases, for instance, crops may benefit from more abundant CO2, but higher temperatures can temper or negate those gains altogether. Do Crops Benefit from Increased CO2? CO2 is one of the primary ingredients that green leafy plants need for growth. When CO2 is combined with sunlight, water and nutrients, plants generate sugars that fuel their growth. Higher concentrations of CO2 can lead to increased sugar production, and in turn, increased plant growth and higher yields. Research also shows that plants use water more efficiently when grown in high CO2 environments, also improving yields. However, the positive benefits of “CO2 fertilization” are not uniform across all plant species. Corn and other C4 plants that already make sugar efficiently will see little benefit from high CO2 levels compared to C3 plants such as soybeans. Even taking the small gains from increased CO2 into account, research shows that stress from rising temperatures is expected to reduce yields in corn. Soybeans do benefit from higher levels of CO2, gaining 10 to 20 percent in yield. While increased CO2 can lead to improved plant growth, this is not true in all conditions and there are some serious unwanted effects. Higher CO2 levels can lead to increased leaf temperatures, which can induce plant stress and limit CO2 growth benefits. Additionally, elevated CO2 levels have been shown to decrease plant protein and mineral content, especially in C3 plants, which has unknown consequences for human and animal health. 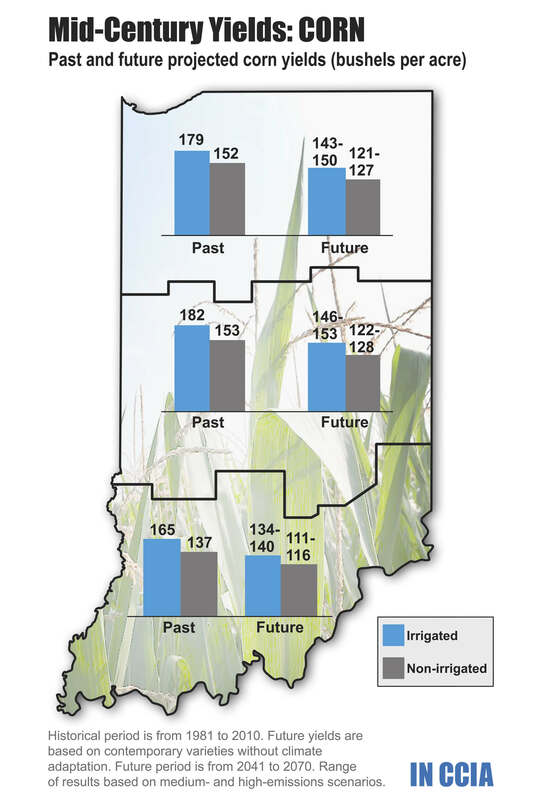 Above: Historical (1981 to 2010) and future (2041 to 2070) corn yields across Indiana for irrigated (blue) and non-irrigated (gray) production systems. Future yields are based on contemporary varieties without any changes in management or technology. The range of future yields represents projections for medium- and high-emissions scenarios. Maps for soybean and wheat yields are also available. Source: Bowling et al. (in review). Lower soil moisture and rising temperatures during the hottest summer months are expected to substantially reduce yields for current corn and soybean varieties. 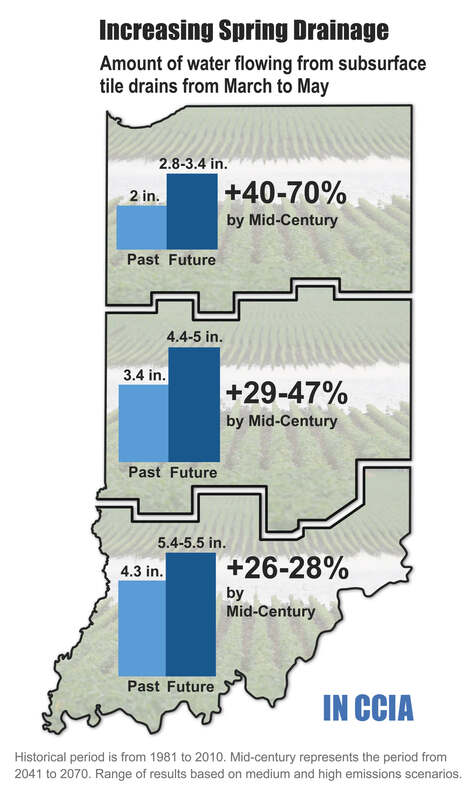 Indiana corn yields, based on these varieties, are expected to decline by about 16 to 20 percent by mid-century for non-irrigated and irrigated production10. Soybean yields are projected to decrease by 9 to 11 percent for nonirrigated and irrigated production10. The crop yield projections for contemporary varieties are based only on changes in weather patterns. Much of the decrease is due to projected increase in drought stress along with extreme heat. Potentially positive effects of increased CO2 in the air and negative impacts of excess moisture stress in the early growing season were not represented. Also, these predictions do not consider any changes in technology or management practices. For instance, plant breeding to adapt crop varieties to our current and future climate is likely to offset a portion of the projected yield reductions, although the extent of these offsets is not yet known. Nighttime low temperatures are another variable contributing to projected yield declines for both corn and soybeans. While heat stress will not be an issue most nights, the rising low temperatures will increase cellular respiration in plants. That requires energy in the form of sugars, which would otherwise be turned into starches in grain. Estimates for Indiana suggest a 2 percent loss of corn yield (or about 3.1 bushels per acre decline) for every 1°F increase in average July minimum temperature (view chart comparing Indiana corn yields and July minimum temperature). Statewide, July minimum temperatures have increased 0.3°F per decade since the 1960s. By mid-century, July minimum temperatures are projected to warm 7.2 to 9°F above the historical average11. An associated problem is that elevated daytime and nighttime temperatures can slow the emergence of flower stigma, so that pollen is shed before the stigma emerges, reducing the number of seeds per pollinated flower. Heavy precipitation and flooding, expected based on climate projections, are also bad for agronomic crops. Projections showing how precipitation extremes would affect Indiana crops specifically are not currently available, but one study suggests a 6 percent loss of corn yield throughout the Midwest due to excessive precipitation by 2030 (Rosenzweig et al. 2002). 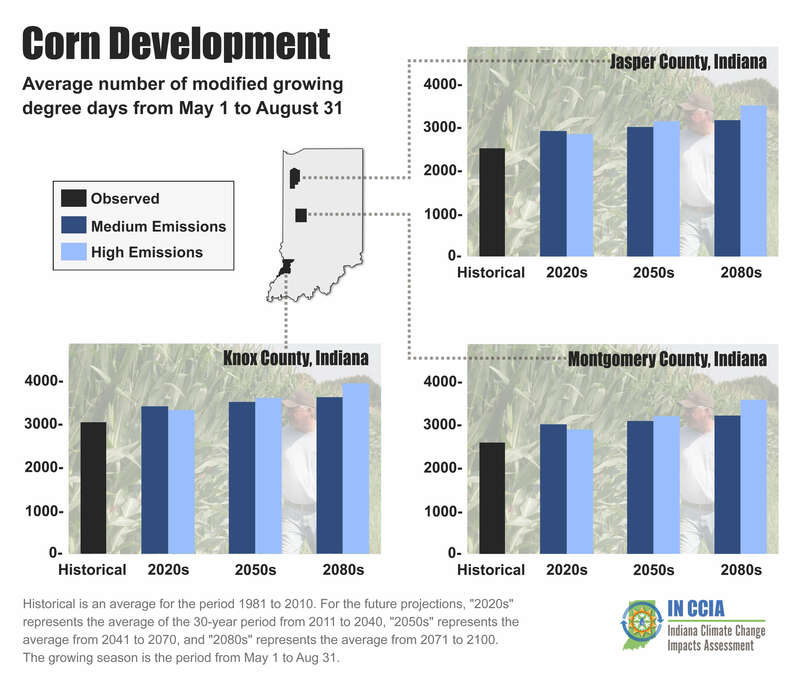 Above: Average number of accumulated Modified Growing Degree Days (MGDD) for three Indiana counties from May 1 to Aug. 31. MGDD are optimized for corn development, calculated using temperature thresholds between 50°F and 86°F. “Historical”is an average for the period 1981 to 2010. For the future projections, “2020s” represents the average of the 30-year period from 2011 to 2040, “2050s” represents the average from 2041 to 2070, and “2080s” represents the average from 2071 to 2100. Source: Bowling et al. (in review). 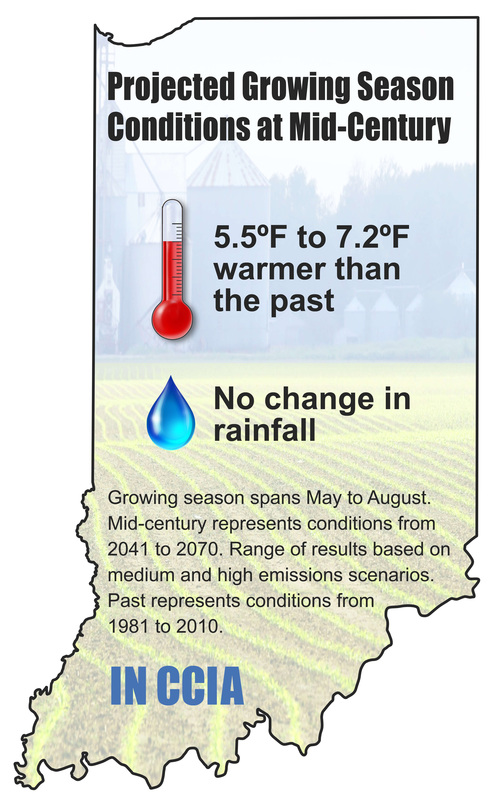 Hoosier farmers can, and will, adapt to Indiana’s changing climate. The types of crops, timing and frequency of plantings, need for irrigation and drainage, effects on weeds and pests, and effects on labor will all have to be taken into account. 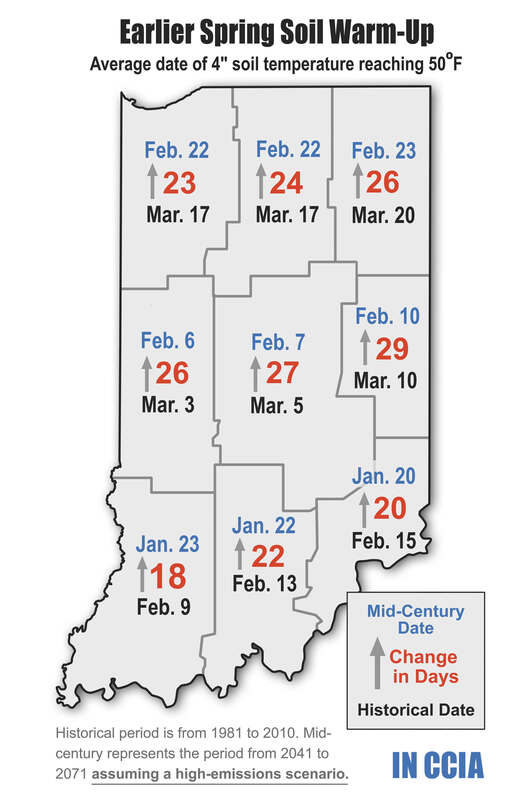 By mid-century, Indiana’s frost-free season is expected to lengthen by 3.5 to 4.5 weeks. Warmer spring soils could allow for earlier plantings, which could facilitate new cropping systems, if soils are not too wet for field access. Northern and central parts of Indiana could move from one crop per season to corn followed by winter wheat in one year, and double-cropped soybeans the following year. Earlier planting or using varieties that more quickly reach maturity could help corn plants avoid summer heat stress during pollination. Breeding corn for traits that contribute to yield in warmer may also help offset the effect of warming overnight temperatures. Above: Date when soil temperature at 4-inch depth first exceeds 50°F for the historical period (1981 to 2010) and mid-century projections (2041 to 2070) based on a high-emissions scenario. Soil temperatures greater than 50°F are recommended for spring planting of corn. These results suggest that soils will be warm enough to plant 18 to 29 days earlier by mid-century. Results for medium emissions scenario are available. Source: Bowling et al. (in review). However, those scenarios are dependent on field conditions being suitable for work earlier in the spring. Spring rainfall statewide is projected to increase 13 to 16 percent by mid-century11. Increased spring precipitation could make fields too muddy for heavy farm equipment, negating some or all of the earlier frost-free season. Days per week suitable for field work, measured by temperature and moisture in the soil, are expected to decline slightly and become less predictable in April, May and June, but field work may shift into March. To minimize this problem, farmers may purchase new machinery, such as tractors with treads, that are better-suited for wet conditions or invest in more subsurface drainage. However, subsurface drainage may be limited by downstream water levels. Drier summer conditions could be managed through increased irrigation, where water is available. By the middle of this century, irrigation could help to reduce projected yield losses by 80 to 100 percent. Irrigation could also overcome projected soybean yield losses, resulting in yield increases of 4 to 40 percent relative to historical non-irrigated yields. However, current research suggests that, much like today, conventional irrigation systems in the future are likely to remain unprofitable over a 25-year investment period when holding seed technology and crop prices constant. Also, groundwater is not economically or physically available in sufficient quantities for irrigation in many areas of the state. On-farm reservoirs could be used in some locations to store drainage water from periods of water excess and provide supplemental irrigation. Such water recycling systems have the added benefit of reducing nutrient losses that impair downstream waterways. Tile drainage may also help to manage increased precipitation, especially during the spring. For those installing new tile, decreasing spacing by 10 percent relative to current practices has been shown to decrease the occurrence of overland flow, which can lead to soil erosion. In addition, no-till, cover cropping, and other soil health management practices can decrease surface soil saturation and increase soil organic matter over time, which can help farmers cope with excessive rainfall. Above: Average date when the first hard freeze of autumn, defined as temperatures at or below 25°F, occurs for the historical period (1981 to 2010) and mid-century projections (2041 to 2070) based on a high-emissions scenario. Air temperatures at or below 25°F trigger the onset of winter dormancy in some fruit trees and vines. These results suggest that winter dormancy will start about nine to 13 days later by mid-century. Results for medium-emissions scenario are available. Source: Bowling et al. (in review). Indiana’s specialty horticulture crops—fruit trees and vines—are especially sensitive to temperature. Rising temperatures can affect plant dormancy periods and disease risk, leading to yield impacts. Warming may also require different varieties of popular apples and other fruits that will be more suitable to Indiana’s changing climate. Many trees and vines need low temperatures that fall below 25°F to begin winter dormancy. By mid-century, the statewide average date of the first hard autumn freeze is expected to occur nine to 11 days later11, and that could affect the hardiness of some crops through increased exposure of the non-dormant plant to cold temperatures. Many perennial plants also require periods when temperatures are between 35°F and 50°F, called “chilling hours,” during which they prepare to break their winter dormancy and blossom (chilling hour requirement table available online). 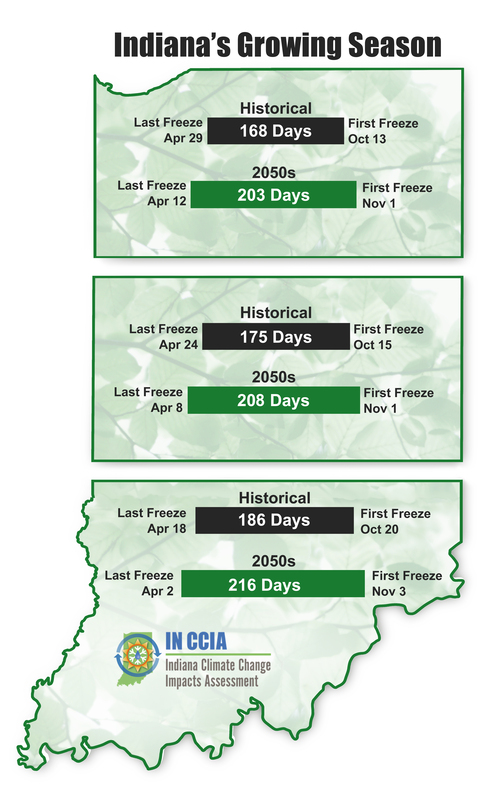 Most specialty crops grown in Indiana need 700-1,300 chilling hours to break dormancy, and Indiana averages between 1,100 and 1,200 annually. But that is expected to decrease by 45 to 65 hours by mid-century11, meaning some crop species may no longer be suitable for the state. In contrast, if chilling requirements are achieved too rapidly, plants may bloom during early spring warm spells, leaving them susceptible to spring frosts that can devastate a crop. The date by which plants achieve sufficient chilling is projected to happen earlier, shifting from March/April historically to February/March in the future. While the average March and April had ten freeze-thaw cycles historically, by mid-century the average February and March will have twelve to thirteen11. This shift will put early emerging crops at greater risk of frost damage. Temperatures that fluctuate too much can lead to resets in chilling hours required to end dormancy, resulting in erratic blooms, yield loss and reduced fruit quality. 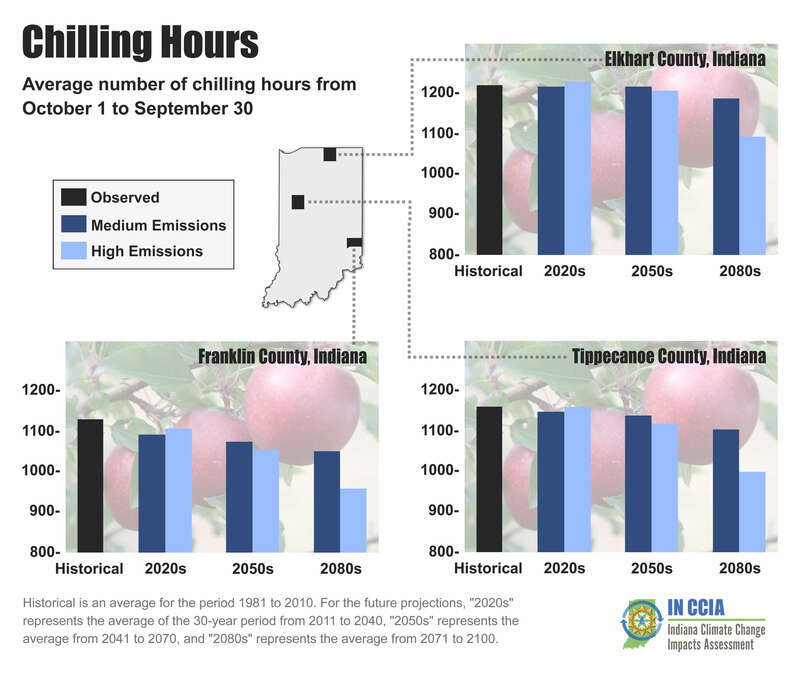 Above: Annual accumulated chilling hours for three Indiana counties in selected regions of the state with fruit production. Accumulation period begins Oct. 1. “Historical” is an average for the period 1981 to 2010. For the future projections, “2020s”represents the average of the 30-year period from 2011 to 2040, “2050s” represents the average from 2041 to 2070, and “2080s”represents the average from 2071 to 2100. Source: Bowling et al. (in review). 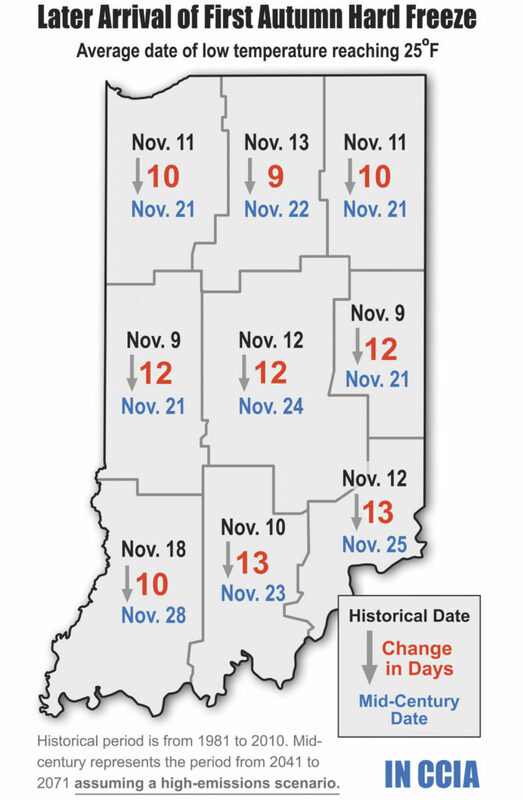 A warming of Indiana’s coldest annual temperatures will shift USDA Plant Hardiness Zone boundaries northward. This shift will expand the suitable range for peach, pluot and nectarine production and it may become possible to grow fruit that currently lacks hardiness for Indiana’s climate, such as boysenberry and tayberry. Warmer summer temperatures will not end apple production in the state, but it is expected that popular varieties such as Golden Delicious and Honeycrisp may be replaced by Braeburn, Fuji and Gala as chilling hour accumulations shift in the state. Many specialty crops require multiple applications of pesticides and fungicides per year, and it’s likely that they will need even more. For fungicides and insecticides, 10 to 20 applications are already common. But increased precipitation can wash those applications off plants more quickly, requiring additional applications and increasing the risk of pesticide resistance. Above: Average date when 1000 chilling hours are accumulated in Indiana. Accumulation period begins Oct. 1. Red colors indicate chilling hours are accumulated earlier in the spring while blue colors indicate later accumulations. “Past” is an average for the period 1981 to 2010. Future projections are an average for the period 2041 to 2070 under a high-emissions scenario. Maps for other time periods and emissions scenarios are available. Source: Bowling et al. (in review). Heat stress, which can lead to life-threatening complications, is the deadliest weather-related threat in the United States. When temperatures rise, our ability to work outdoors for long periods rapidly declines. This is a significant concern for Indiana’s fruit and vegetable production as crops such as apples, blueberries and melons require hand-picking. More frequent and intense extreme heat and increasing humidity are expected to have serious impacts on Indiana’s outdoor labor force in the coming decades. 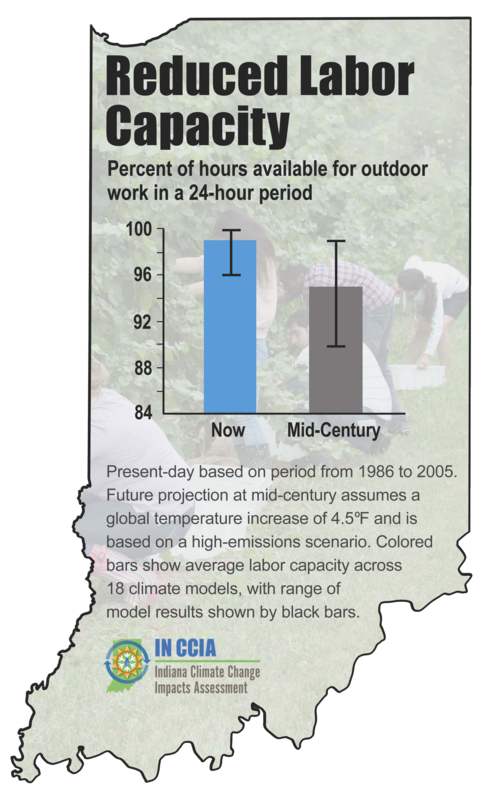 Historically, Indiana’s labor capacity—the percentage of hours available for outdoor work in a 24-hour period—has been about 99 percent on average, meaning extreme heat rarely affects our work force. By mid-century, as global temperatures increase by 3 to 4.5°F, Indiana’s labor capacity is projected to decline to about 95 percent for both the high- and medium-emissions scenarios. Labor capacity will continue to decline by late century as global temperatures rise, with a projected average labor capacity of 89 to 95 percent based on high- and medium-emissions scenarios, respectively12. Heat-related illnesses are preventable. Providing outdoor laborers with cooling stations and enforcing rehydration breaks are ways to cope with extreme heat. Increasing awareness among laborers and supervisors about the warning signs of heat stress (disorientation, heat rashes and profuse sweating), and identifying serious medical emergencies such as heat stroke (erratic heart rate, cessation of sweat, hot skin, unconsciousness), can save lives. Projecting the effects of climate change on livestock and poultry is complex because of the different types of animals and management practices used throughout the state. Rising temperatures can cause issues that range from less efficient operations all the way to death. Animals that are housed in confined facilities may not experience as much heat stress as pastured animals, but operators will have to pay more to keep their animals cool. Above: Average duration of heat stress events historically (1981 to 2010) and at mid-century (2041 to 2070). A heat stress event for livestock and poultry occurs when the daily high temperature reaches 86°F or above. The range represents projections for medium- and high-emissions scenarios. Source: Bowling et al. (in review). Indiana is expected to experience far more days per year in which livestock and poultry are heat stressed, which reduces animal feed intake, productivity and fertility. Animals are stressed at temperatures above 86°F. Historically13, Indiana has had about 40 of these days per year. By mid-century, animals could experience heat stress on about 87 to 99 days per year11. In addition, the average length of heat stress events is also expected to double, from 3 days in the past, on average, to 6 to 8 days by mid-century11. One example of how heat can hurt production can be seen in milking cows, which eat less as temperatures rise. Animals generally decrease feed intake by 3 to 5 percent for every 1.8°F increase above 86°F (NRC 1980). They also transfer energy, now depleted from eating less food, from milk production to cooling their bodies. Energy requirements for a cow increase 22 percent as the temperature rises from 60°F to 90°F. Research suggests that an Indiana cow that produces 32 kg of milk per day will see a decline of up to 4 kg per day by mid-century (Wolfe et al. 2008). Effects on pasture systems are most likely to be at issue in southern Indiana where there are more beef operations. The growing season will lengthen, meaning more forage could be available for pastured animals. However, there is a risk of damage to perennial forage crops, such as alfalfa, as winter temperatures rise and decrease the plants’ hardiness. Loss of snow cover and a change from snow to rain can leave perennial plants exposed to ice and soil heaving as well (Belanger et al., 2001). Cultivars that are less likely to respond quickly to a brief warm spell in late winter can be used, but those have lower yields and become dormant so early that they negate any benefit of a longer growing season. Without dietary intervention, cattle could become increasingly protein-stressed this century, as has been observed in the United States over the last couple of decades (Craine et al. 2018). Many forages, including grasses and legumes, are known to lose nitrogen as temperatures rise (Fritschi et al. 1999). Nitrogen content may decrease by 16 to 22 percent by mid-century, in turn, decreasing protein content that benefits animals and is necessary for production of meat and milk. Furthermore, heat makes animals feel fuller longer, meaning they’ll eat less, decreasing productivity. Livestock and poultry producers are likely to deal with higher feed costs as competition for local corn and soybean crops increases. Those using indoor facilities that create microclimates for animals will likely face higher costs. More ventilation may be required, raising energy, operations and maintenance costs. It’s estimated that climate-related management adjustments will account for 3 percent of livestock costs by 2045 (Weindl et al. 2015). Pasture systems may also spend money on more field shelters and environmental buffers to keep their animals cool. Ruminant producers can minimize animal overheating by reducing the amount of dry matter in feed. With rising corn prices, distiller’s dried grains with solubles may be a cost-effective solution for feed. Breeding success may decline, as heat tends to decrease fertility. Tailoring genetic resources to improve heat tolerance is possible, but this often comes at the expense of production. Above: Average amount of water flowing from subsurface tile drains during the spring for the past (1981 to 2010) and future (2041 to 2070). The future range represents projections for medium- and high-emissions scenarios. Source: Bowling et al. (in review). The cumulative influence of direct climate impacts and indirect effects associated with climate and management decisions have the potential for multi-level change to agriculture production. Soil and water quality will be affected by climate change, with potentially large increases in erosion. Heavier and more frequent rain, especially in the spring, is expected to increase runoff and drainage from farm fields, while increasing temperatures will make soil management more challenging and could stress groundwater resources. About half of Indiana cropland contains subsurface tile drainage. These buried, permeable pipes drain excess water away from fields and into nearby rivers and streams, taking with it nitrate and other nutrients that were applied to soil to improve crop productivity. High nutrient levels in waterways cause excessive plant growth that, in turn, depletes oxygen to deadly levels (called “hypoxia”) for fish and other aquatic species. Averaged over the areas with existing drainage in Indiana, annual subsurface drainage is projected to increase by 17 to 25 percent (2-3 inches) by mid-century11, with the peak drainflow period happening earlier in the winter/spring. Spring drainage, specifically, will increase by 32 to 48 percent (1 to 2 inches) statewide by mid-century11. As summers become hotter, with little to no precipitation change, increasing water stress will lead to a greater potential benefit from irrigation. The median growing season water deficit—the difference between growing season precipitation and water demand—is expected to double by mid-century, increasing from 3.7 inches historically to 7.6 to 8.1 inches in the future11. Absent the purchase cost of the irrigation system, the additional income from higher irrigated crop yields compared to non-irrigated yields will increase revenue. However, when repayment of the irrigation system equipment is included, irrigation is not expected to be a profitable investment for many locations in the state, even in a changing climate. Growers will need to consider building soil organic matter, which is key for holding nutrients and water in the soil. However, decomposition of soil organic matter increases with temperature—a rule of thumb is that decomposition doubles for every 10 degrees Celsius (18 degrees Fahrenheit) of temperature increase. Carbon loss from soils increased in tests plots with higher temperatures and enhanced CO2. Farmers can offset losses by changing management practices to improve soil quality, but without those management changes, it’s estimated that soil organic matter decomposition will increase 44 to 57 percent by mid-century11. Erosion can also quickly deplete soil organic matter, and heavier rains expected during the spring could increase erosion by 17 to 29 percent by mid-century (Nearing, 2001; Pruski and Nearing, 2002a). Other estimates suggest that for every 1 percent increase in daily precipitation intensity, erosion could increase by about 2 percent (Pruski and Nearing 2002b). In addition to climate change’s impact on desirable plants and animals, undesirable pests and weeds will also create new problems for farmers as temperatures rise and precipitation patterns change. Disease pressure in many cases can be tied to rising temperatures. 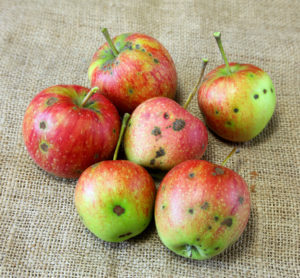 Diseases of once-minor importance, like bitter rot affecting apples, for example, are linked to increases in temperatures that deviate above the 30-year average. In 2015, temperatures 1.9°F above that average contributed to the loss of 20 to 100 percent of the Honeycrisp and Gala apple harvest in Indiana and surrounding states. Prior to 2010, there were few reports of this problem in the Midwest. Other diseases, such as apple scab, gray mold of small fruit, brown rot of stone fruit and Phytophthora root rot, increase with moisture. Conversely, powdery mildew increases with dry summer conditions and may better survive warmer winters, increasing pressure on crops. Invasive pests, such as soybean aphids, appear in climates that are similar to ones in the countries in which they originate. Some pests like armyworm and corn earworm are present nearly every year in southern Indiana but are rarely or never seen in other parts of the state because temperatures aren’t high enough (Diffenbaugh et al. 2008). That is likely to change in the future. Increased CO2 has also been shown to boost losses to soybeans from Japanese beetles. Increasing winter soil temperatures and reductions in soil frost depth may change overwintering habits of some species, resulting in increased persistence of pest infestations. Pasture-based cattle and small ruminants are susceptible to parasitic worms. In European cities with climates that match Indiana’s projections, instances of diseases associated with these worms has tripled or quadrupled in recent decades and are associated with flooded farmland from increased rainfall (Skuce et al., 2013). In poultry, heat waves have been shown to increase instances of red mites (Skuce et al., 2013). Warm winters will extend the geographic range of weeds, including aggressive and herbicide-resistant weeds like Palmer amaranth, northward, impacting productivity. Many invasive plants and insects will also benefit from warmer temperatures and moisture. Research shows that velvetleaf is likely to decline in southern Indiana by the end of the century (McDonald et al. 2009). Johnsongrass, a weed now causing significant issues in southern Indiana, is expected to migrate northward and become a growing problem across Indiana (Taylor et al., 2018). Other research suggests weed-crop competition will change. Higher temperatures are expected to benefit some weeds over soybeans and melons, and higher CO2 benefits other weeds more than crops such as corn and sorghum. Research shows that seedlings of many weed species grow faster under warmer conditions, reducing the optimal time window for herbicide application. These species include Palmer amaranth, common waterhemp and redroot pigweed, which are significant problems in Indiana. Many weeds allocate increased amounts of carbon to tissues underground as CO2 increases, making them more difficult to control with herbicides (Ziska 2016). Increased rain makes applying herbicides more difficult, too. Agricultural production is influenced by complex interacting factors associated with personal decisions (such as in-field management practices), technological advances (such as crop breeding) as well as local and global economic trends. This study does not address the economic impacts of climate change on the agricultural sector or the rippling effects of global factors on local land use decisions. Nor does it address the effect of local land use decisions on downstream ecosystems. The impact of severe weather—extreme rainfall, wind and hail—on crop production is under represented in this analysis. Improvements will require weather prediction models that can resolve smaller-scale processes (such as convection and thunderstorms), as well as crop models that can represent these impacts. Additional research is needed to better understand the effects of compounding environmental stressors on crop yields, soil health and the effectiveness of water management practices. More work is also needed to evaluate the role of conservation practices in building on-farm resilience to changing temperature and rainfall patterns. Research that improves our ability to understand and simulate multiple interacting factors, while highly complex, will improve our ability to anticipate current and future threats to Indiana agriculture. This report brings together past research and new climate projections for Indiana to examine the implications of climate change for the state’s agricultural sector. Rising temperatures and changing precipitation patterns will substantially affect many aspects of Indiana’s agricultural operations. Corn yields (based on currently available varieties) are expected to decline by 16 to 20 percent by mid-century, with worsening losses by late century, due to heat and drought stress, though irrigation, soil management practices and cropping decisions could offset some losses. Soybeans are expected to have reduced losses as higher CO2 concentrations help offset some of the negative effects from heat and drought. Double-cropping of soybeans may be possible in some parts of Indiana. Warming winters may damage forage quality while warming, losses of soil nitrogen and increases in atmospheric CO2 may cause decreased protein content. New cultivars may help with some of these issues. Rising temperatures will stress livestock and poultry and could increase feed and cooling costs for producers. Sensitive fruit crops that have specific temperature needs are at risk of losing hardiness and breaking dormancy early, exposing buds to damaging frosts. Some popular apple, peach and grape varieties may no longer be suitable for parts of the state. Other varieties, and other fruit species such as pluots, nectarines and some berries, may be newly suitable for Indiana’s climate in the future. An earlier frost-free season may allow additional early season field work and planting, but that could be offset in many years by increased spring rain that makes fields too muddy to work in. The impacts of weeds, disease and pests are difficult to predict, but warmer temperatures will allow overwintering of some species that previously could not tolerate Indiana’s climate. More precipitation is likely to increase pressure from these factors as well. Additional precipitation, along with more subsurface soil drainage, will wash nitrogen from fields, reducing the quality of nearby and downstream water. Soil quality is also at risk as changing temperature and rainfall patterns affect erosion and soil organic matter decomposition rates. To remain economically competitive, farmers will need to adapt to these challenges and opportunities. This will involve thinking broadly about the most beneficial crops, management practices and rotations to employ in Indiana’s shifting climate. Bélanger G, Rochette P, Bootsma A, Castonguay Y, and Mongrain D. (2001). Impact of climate change on risk of winter damage to agricultural perennial plants. Climate Change Action Fund Project A084. Final Report. Bowling, L., Beckerman, J., Brouder, S., Buzan, J., Cherkauer, K., Doering, O., Dukes, J., Ebner, P., Frankenberger, J., Gramig, B., Kladivko, E., Lee., C., Volenec, J, and C. Weill. (in review). Agricultural Impacts of Climate Change in Indiana and Potential Adaptations. Climatic Change. Buzan, J. R. and M. Huber. (in review). Robust scaling with global mean temperature of future heat stress projections. Environmental Research Letters. Byun, K. and A.F. Hamlet. (2018). Projected Changes in Future Climate over the Midwest and Great Lakes Region Using Downscaled CMIP5 Ensembles. International Journal of Climatology, (in press). Craine, J.M., Elmore, A. and Angerer, J.P. (2017). Long-term declines in dietary nutritional quality for North American cattle. Environmental Research Letters, 12: 044019. Diffenbaugh NS, Krupke CH, White MA, Alexander CE. (2008). Global warming presents new challenges for maize pest management. Environmental Research Letters, 3 (2008) 044007 (9pp), http://dx.doi.org/10.1088/1748-9326/3/4/044007. Fritschi, F.B., Boote, K.J., Sollenberger, L.E. & Allen, L.H. Jr. (1999). Carbon dioxide and temperature effects on forage establishment: tissue composition and nutritive value. Global Change Biology 5: 743-753. Jin, Z., Q Zhuang, J Wang, SV Archontoulis, Z Zobel, VR Kotamarthi. (2017). The combined and separate impacts of climate extremes on the current and future US rainfed maize and soybean production under elevated CO2. Global Change Biology 23: 2687-2704. Jin, Z. EA Ainsworth, ADB Leakey, DB Lobell. (2018). Increasing drought and diminishing benefits of elevated carbon dioxide for soybean yields across the US Midwest. Global Change Biology 24: e522-e533. Loladze, I. (2014). Hidden shift of the ionome of plants exposed to elevated CO2 depletes minerals at the base of human nutrition. Ecology, Epidemiology and Global Health https://doi.org/10.7554/eLife.02245.001. Long, S.P., Ainsworth, E.A., Leakey, A.D., Nösberger, J. and Ort, D.R. (2006). Food for thought: lower-than-expected crop yield stimulation with rising CO2 concentrations. Science 312: 1918-1921. McDonald, A., Riha, S., DiTommaso, A, DeGaetano, A. (2009). Climate change and the geography of weed damage: analysis of US maize systems suggests the potential for significant range transformations. Agriculture, Ecosystems & Environment 130: 131-140. Myers, S., et al. (2014). Increasing CO2 threatens human nutrition. Nature 510: 139-142. Nearing, M.A. (2001). Potential changes in rainfall erosivity in the US. with climate change during the 21st century. Journal of Soil and Water Conservation 56(3):229-232. NRC. (1980). Mineral Tolerance of Domestic Animals. National Academy Press, Washington, DC. Pruski, EE and M.A. Nearing. (2002a). Climate-induced changes in erosion during the 21st century for eight U.S. locations. Water Resources Research 38(12): 1298. Pruski, EE and M.A. Nearing. (2002b). Runoff and soil loss responses to changes in precipitation: a computer simulation study. Journal of Soil and Water Conservation 57(1): 7-16. Rosenzweig C, Tubiello FN, Goldberg R, Mills E, Bloomfield J. (2002). Increased crop damage in the US from excess precipitation under climate change. Global Environmental Change 12:197-202. Skuce PJ, Morgan ER, van Dijk J, Mitchell M. (2013). Animal health aspects of adaptation to climate change: beating the heat and parasites in a warming Europe. Animal 7:333–345. Taylor, R.AJ., Herms, D.A., Cardina, J., and R.H. Moore. (2018). Climate Change and Pest Management: Unanticipated Consequences of Trophic Dislocation. Agronomy 2018, 8(1), 7. Weindl I, Lotze-Campen, Popp A, Müller C, Havlík P, Herrero M, Schmitz C, Rolinski S. (2015). Livestock in a changing climate: production system transitions as an adaptation strategy for agriculture. Environmental Research Letters 10:094021. Wolfe DW, Ziska L, Petzoldt C, Seaman A, Chase L, and & Hayhoe K. (2008). Projected change in climate thresholds in the Northeastern U.S.: implications for crops, pests, livestock, and farmers. Mitig Adapt Strat Glob Change 13:555–575. Ziska, L.H. (2016). The role of climate change and increasing atmospheric carbon dioxide on weed management: Herbicide efficacy. Agriculture, Ecosystems & Environment 231: 304-309. 2 To achieve the medium scenario, global greenhouse gas emissions must be significantly reduced almost immediately and peak in the 2040s before declining. Under the high scenario, greenhouse gas emissions continue to increase until late this century. The high-emissions scenario represents our current trajectory. 3 USDA NASS Quick Stats for Indiana, 2017, available here. 5 Projected change in temperature averaged across 10 climate models for two scenarios of heat-trapping gas emissions based on analysis by Hamlet et al. (in review) and Widhalm et al. (2018). Mid-century refers to the 30-year period from 2041 to 2070. Late century refers to the 30-year period from 2071 to 2100. Future temperature changes are relative to the statewide annual average temperature from 1971 to 2000. Further details provided in Widhalm et al. (2018). 6 Projected change in growing season temperature and precipitation averaged across 6 climate models for two scenarios of heat-trapping gas emissions based on analysis by Bowling et al. (in review). Projected changes at midcentury (2041 to 2070) are relative to the historical period from 1981 to 2010. 7 Projected change in precipitation averaged across 10 climate models for two scenarios of heat-trapping gas emissions based on analysis by Hamlet et al. (in review) and Widhalm et al. (2018). Mid-century refers to the 30-year period from 2041 to 2070. Late century refers to the 30-year period from 2071 to 2100. Future precipitation changes are relative to the statewide annual precipitation from 1971 to 2000. Further details provided in Widhalm et al. (2018). 10 Crop yield projections are for current varieties and are based only on changes in weather patterns. These predictions do not consider changes in technology or management practices. For irrigated crops the simulation assumes that water is always available for irrigation. Mid-century represents average conditions from 2041 to 2070. Future changes are relative to the historical period 1981 to 2010. 11 Future changes are relative to the historical period 1981 to 2010. Range of future projections based on medium- and high-emissions scenarios. 12 Labor capacity estimates were generated for 18 different climate models. Values presented here indicate the average prediction across all models for medium- and high-emissions scenarios. Some models show more extreme declines in Indiana, with mid-century labor capacity as low as 92 percent and late-century capacity as low as 80 percent. 13 Historical period is from 1981 to 2010. We thank Brian Wallheimer for drafting this report, Stan Coffman for assistance with graphics, and staff from Purdue University’s Department of Agricultural Communication, including Maureen Manier, Erin Robinson, Andrew Banta, Steve Doyle, Russell Merzdorf and Morgan Grosso for help with the production and release of the report. PCCRC managing director Rose Filley provided valuable input. Nina Collins and Marcia Wilhelm-South from the Purdue University Libraries Scholarly Publishing Division provided online publication support for all documents associated with the IN CCIA. If you have trouble accessing this page because of a disability, please contact Indiana Climate Change Impacts Assessment at agweb@purdue.edu.